I just read that Jesus Christ Superstar starring Ted Neeley is having its farewell tour. I’m not sure if they are saying its Ted’s farewell or the whole play? Now we can say farewell to a play such as Cats but not Jesus Christ Superstar…this is an awesome show. I have seen the original production and the newer version where they wear today type clothing and I must say I do prefer the old garb…the traditional biblical style of cloth draped about. My question is; do we think 65 is too old for someone to play Jesus? Is this age also too old for Mary Magdelene? 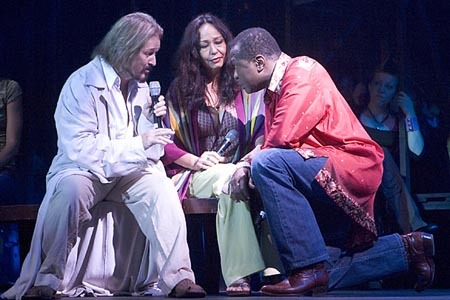 I found this photo taken in “08” with Ted Neeley and Yvonne Elliman playing the roles that made them famous, the roles they played in the early 70’s. I think if I was a newbie to JCS I would think they were miscast but since I know they are the originals from the touring show they can still pull it off and I would enjoy the nostalgia of it all. I grew up listening to this album, it was played in my house constantly; I know every word. It’s an wonderful play and if you have not seen it you should catch this “farewell” tour, I am going January 2010! You know Cher had her farewell tour and now she is playing in Vegas. Does CLASSIC ENTERTAINMENT ever go away…why should it.